By most accounts, it’s a surprise Oklahoma made it to 10-2 and into the Sugar Bowl. By most accounts, it’s a disappointing finishing game for Alabama. We know why in both cases. Here are four questions we don’t know the answer to now, but we will on Jan. 2. 1. Does Oklahoma have any chance of staying close to Alabama? Most don’t think so as the Sooners are more than a two touchdown underdog, but the fact is, at least this season, OU has to be pretty used to be playing the underdog role.Especially lately. The Sooners were an underdog against Baylor, Kansas State and Oklahoma State this season and all games came in the second half of the year. OU finished out the season with back-to-back road wins as underdogs at both Kansas State and Oklahoma State, so momentum is definitely in OU’s favor. Alabama is coming off a loss. However, if there were a four-team playoff this year, even with the late-season loss to Auburn, there would be a lot of people expecting Alabama to win the title. "We’re just ready to get back out there and prove ourselves all over again," said Alabama cornerback Deion Blue. No one thinks Alabama isn’t good because the Tide lost to Auburn. They’re just not going to win the national title. If Oklahoma and Alabama would have met three weeks ago, absolutely no one would have given the Sooners a chance. The best thing OU has going for it is a late-season surge, however, Alabama isn’t a flawed a team because it gave up a fluky play at the end of the Iron Bowl. 2. What will Alabama’s motivation be? While we may not find out the answer to the first question above until late in the game, the second question could be answered in a matter of moments. After all, this Alabama team was expected, projected and picked by pretty much everyone to be in the national championship game. Now that the Tide isn’t, it will be interesting to see just how interested they are in playing Oklahoma. "We want to come out and play this last game of the season well, and come out of it with a victory," said Alabama safety Ha Ha Clinton-Dix. Well, yeah, you’re supposed to say that, but while the Sooners have a lot to gain, the Tide have virtually nothing to gain. It doesn’t mean they are going to come out flat, but then again, it doesn’t mean they will come out with the same urgency as they would if there was some crystal hardware given at the end of the game. 3. How much will we see Trevor Knight? Or Blake Bell? Or Kendal Thompson? Yes, it’s a reusable question, applicable every game until the Sooners prove they have come to a conclusion at the quarterback spot. 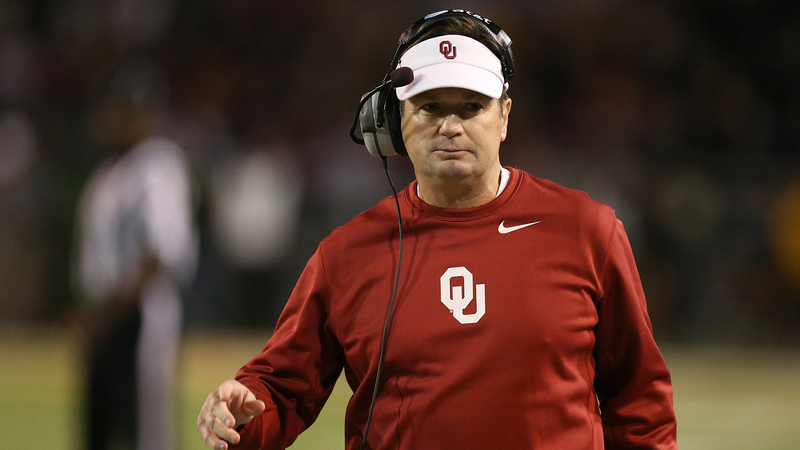 Coach Bob Stoops wouldn’t say who Oklahoma would play at quarterback after Knight and Bell and Thompson were used in the game against Oklahoma State. And he hasn’t said since the team arrived in New Orleans, either. Guessing it will be Knight seems to make the most sense. Oklahoma is a better team when the offense trends toward running. However, Bell led the team down the field at Stillwater, Okla., to a Bedlam, last-second victory. Guessing there will be a combination of Knight and Bell seems to the most likely thing to happen. "They are both good quarterbacks," said Alabama’s Blue. "They’re both going to run the ball. We’ve got to prepare for both of them." 4. Will Oklahoma be able to run on Alabama? Forgotten after Oklahoma rallied past Oklahoma State is the fact the Oklahoma’s running game has been pretty good all season long. Through 12 games this year, OU is averaging 235 yards per game. That’s the most yards rushing for an OU team under Bob Stoops and the best season running the ball for the Sooners since 2004 when OU went 12-1 and faced USC in the BCS title game. The Sooners had back-to-back 300-yard rushing game, the first time they have done that since 1997. A lot of it is due to senior Brennan Clay, who has never been considered the most-talented back on campus the past four years, but he has become the most-reliable. Clay has a 200-yard rushing game this year, had a 76-yard touchdown this season, has caught four passes in a game three times this year and is in the top-30 all time at Oklahoma in all-purpose yards. Now on Alabama? Who knows.Alabama is second in the nation in scoring defense (11.3) and led the SEC in total defense (247). Alabama is allowing just 108 yards per game rushing â good for 11th in the country and second in the SEC.